For this tutorial you can use a low cost Cisco router and of course you need some serial interfaces available on this router. I will use a 7206 with 3 serial interfaces. This router I will call R6 and the rest of the three routers connected to R6, will be R2, R5 and R9. In this way it will be easier for you to understand how the frame-relay routing is achieved. you’ll notice that we have 3 active serial interfaces, each being connected to one of the three routers R2, R5 and R9. Now that we have defined the DLCI numbers lets configure R6 router as frame-relay switch. This command enable the switching of packets based on the data?link connection identifier (DLCI) inside your router. With frame-relay route command we tell to frame-relay switch where to forward the packets based on the DLCI number. If we take a look to the first frame-relay route command, than the path to DLCI 502 is interface Serial5/1:2. If you feel confuse, please check again above the interface connection to the router and the assigment scheme for DLCI numbers. Having a look to S5/1:2, first frame-relay route command, here we configure the path back from R5 to R2, by telling the frame-relay switch to chose interface S5/0:1 to send packets to DLCI 205 (R2). 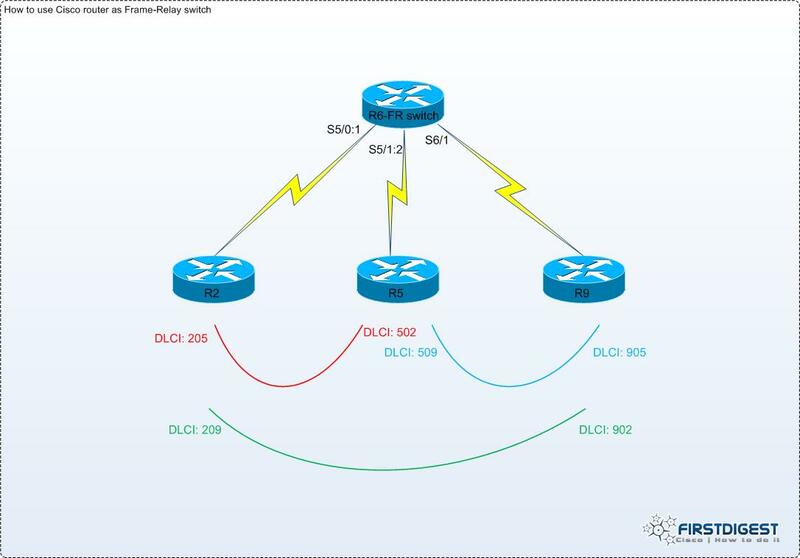 This is the basics of how to configure a Cisco router as a frame-relay switch. If you need help, please don’t hesitate to use the comment form below. -My Cisco frame T1 router is sending out a loop code to the telco doubler which is causing the doubler to loop back severing the connection to the internet -the telco “un-looped” the signal on their end to get them up and running until is it determined how they can prevent this loop back signal from being processed on their system. I'm not sure what this loop code they're referring to. what adjustments do we need to make?